Among the largest chameleons in the world, Calumma parsonii males have ridges running from above the eyes to the nose, forming two warty horns. There are two recognized subspecies: The widespread C.p.parsonii that has no dorsal crest and C.p.cristifer that has a small dorsal crest. Calumma parsonii’s colour varies from green, turquoise and yellow, and juveniles may have an orange sheen. There are four locales of C. parsonii; the orange eye aka white-lipped, the yellow lip, the yellow giant and the green giant. Parson’s Chameleons can get quite large with some specimens obtaining weighs well over 1000 grams and 2 feet in length so having the ability to provide enough space as your Parson’s grow is important. 0.6 x 0.6 x 1.2 meters (2 x 2 x 4 feet) screen or solid sided cage with adequate ventilation will work fine for young adults, 1.2 x 0.6 x 1.2 meters (4 x 2 x 4 feet) should be considered adequate minimum size for an adult with larger cages being best. Parson’s Chameleons should generally be housed separately. Although pairs can be kept together during mating season once mating has occurred or signs are observed that they no longer want to be near each other, they should be separated. In my experience keeping Parson’s together isn’t a good idea, initially things may look normal but with careful observation subtle indications of stress can be seen. Females will show aggression towards each other if left together injury can result. Parson’s can be housed outside as long as careful attention is paid to changing weather conditions. I have kept Parson’s outside from Spring to Fall and as long as they can be kept cool with a good misting system and have a well planted enclosure they can tolerate temperatures around 31-35 °C (88-95 °F) and lows around 8-12 °C (46-55 °F). No Substrate is needed. 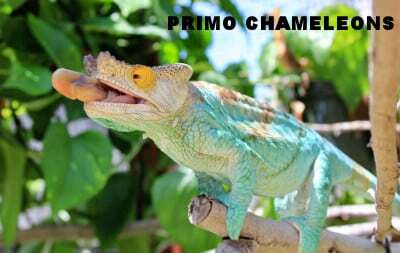 Parson’s like other chameleons will eat substrate either intentionally or by accident when shooting prey. I generally cover any exposed soil in potted plants to discourage this behavior. If substrate is used organic soil would be preferred. Linear tube type fixtures work well. I use different bulbs depending on cage size and age of the chameleons. Baby cage lighting consists of one Reptisun 5.0 and one 6500k flourecent bulb. I also use these lights on adult cages as well as T5 and T8 Reptisun 10.0 and and T5 Arcadia 6% bulbs. A low watt spot light is used which is generally 25 to 40 watts. Ambient day time temperatures from the 24-29 °C (75-85 °F) with night temperatures in the 13-18 °C (55-65 °F) is a good range to try to achieve with spot basking between 26-29°C (80-85 °F). It’s important to provide a canopy with planting between the perches and the lights so they are able to escape the lights as needed. Parson’s Chameleon are big drinkers and an automatic misting system is very important. I adjust misting times and duration depending on ambient temperatures and time of year. During warmer times of the year misting times and frequency is increased. During Winter, misting times and duration are shortened. Parson’s will often drink for long periods of time. My misting sessions are often 30 to 60 minutes in length. 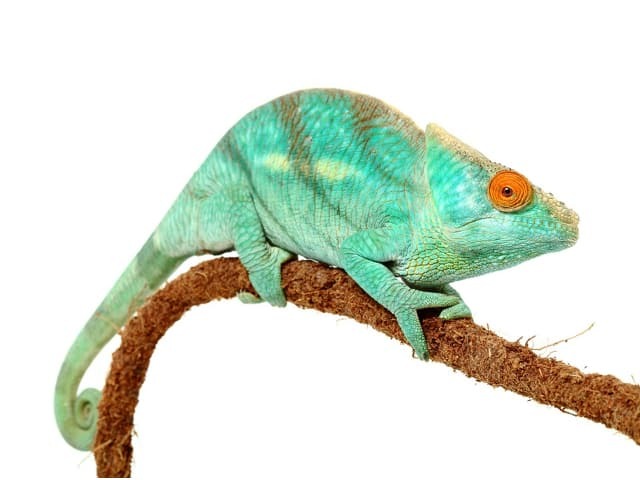 Maintaining proper humidity can be a challenge depending on where Chameleon keepers live. Having a proper misting system or drip system is very important. If using screen cages, covering the back and sides of the cage and having plenty of live plants can help maintain humidity levels. Parson’s Chameleons can be picky eaters so having a variety if feeders is important. They will readily take a wide variety for feeders including but not limited too, Roaches, Superworms, Hornworms, Crickets, Grasshoppers, Mantids, Walking sticks, and flying insects like Moths. Parson’s will sometimes stop eating, whether this is because of boredom with the food provided, changes in weather or Brumation it can last for long periods of time. This can be quite stressful for the owner but as long as there are no health issues they should return to eating when they are ready. Some Parson’s take to handling more than others. Parsons will exhibit stress colors and patterns when uncomfortable and should not be handled if this is evident. Normal cage cleaning practices should be followed. Removing feces before feeders eat it is always a good idea. Also due to the amount of water from a good misting system having good drainage is very important. Proper hydration will lead to good sheds. Parsonii are susceptible to mouth disease known as Stomatitis. Mouth inspections should be routinely done. Be observant to discolorations along the teeth and gum lines, this will normally be your first indication of a problem. Immediate treatment is necessary as this can spread into the jaw bone and cause permanent damage or death. Parsonii can also develop sores on the pads of their feet. Inspections of their feet should be done on a regular basis. You will notice redness at first that could develop into open sores if not addressed and can be very difficult to treat. Some things that can lead to this are, constantly wet peaches and branches, improper branch and perch size and roughness. Having a variety of different size branches, perches and vines is important for proper foot health.